Qualcomm unveiled the Snapdragon 855 back in December. It’s been almost two months since then but the SoC has yet to make its way into consumers' hands, with all information on its performance being from second-hand benchmarks. Yet another such benchmark listing has surfaced, but this time it comes with an interesting tidbit: The device being tested was made by Google. 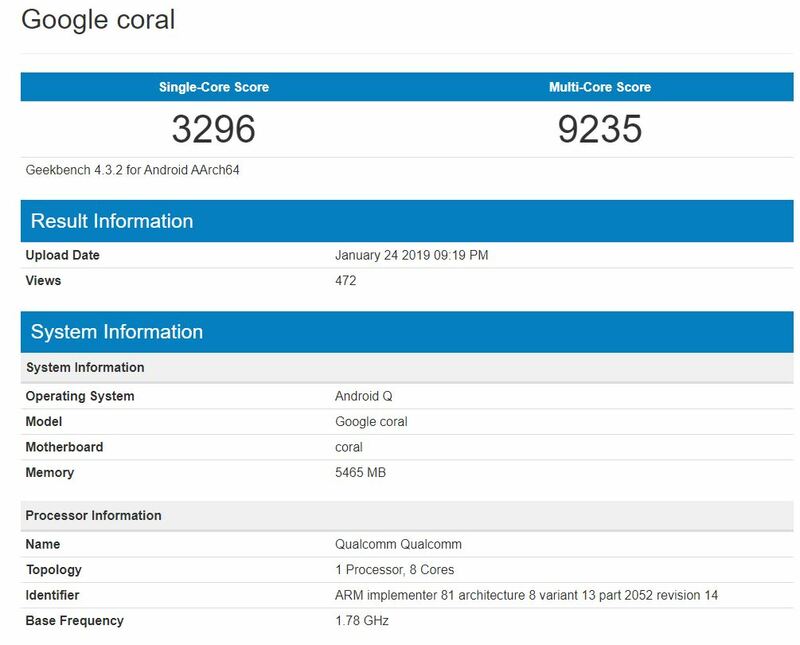 The device, running on Android Q and codenamed “Coral” earned a score of 3,296 in the single-core test, and a multi-core score of 9,235. Those scores are rather underwhelming, all things considered. The Galaxy S10+ was on Geekbench a while ago and made off with scores of 3,413 and 10,256 in the single and multi-core tests respectively. For some perspective, the Exynos 9820 S10 model was benchmarked and had a result of 4,382 and 9,570 in the two tests. 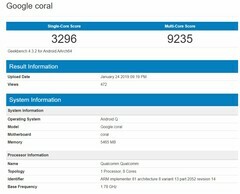 The Kirin 980 generally scores about 3,300 and 9,800, while the A12 Bionic sits comfortably at the top of the pile with scores in the region of 4,800 and 11,400. Google’s Pixel phones have aquatic-themed codenames. The Pixel 3 and 3 XL are codenamed “Blueline” and “Crosshatch” respectively, while the upcoming Pixel 3 Lite and 3 XL Lite are codenamed “Sargo and Bonito.” All four are names of fish. “Coral” is a direct continuation of that trend. As such, there’s a chance we’re having our first look at the Google Pixel 4, or at least its earliest hardware.